← Bike to Work 3: Separate or Equal? The cycling cultures of Paris in the 1940s and early 1950s were varied and interesting. A few years ago, Bicycle Quarterly Vol. 5, No. 3 used this culture as a starting point to explore cycling for transportation. The porteurs were a particularly fascinating mix of transportation and sport. They were newspaper couriers who delivered newspapers from the presses to the newsstands all over Paris. What might have been a menial, minimum-wage job in other places evolved into a unique and even competitive facet of Paris’ cycling culture. For this issue of Bicycle Quarterly, I interviewed two porteurs de presse, Pierre Vitupier and Jacques Greiffenberg. Back then, newspapers published multiple editions every day, and delivery had to be swift. Couriers got paid per paper delivered, so the faster they rode, the more money they made. The best runs were those where the newsstands were just short distances apart. They were assigned by seniority… The two old porteurs explained how a good porteur could make more money than the directors of the newspaper where he worked. Many porteurs were amateur or semi-professional racers who used their jobs for training, so it was natural to organize a race of the porteurs every year. The course started in the newspaper quarter of Paris, went around the Boulevards Extérieurs before climbing the hill of Montmartre. Riders had to carry 15 kg (33 lb) of newspapers. At the half-way point, they had to exchange their load for another pack of newspapers. Much of the course went over cobblestones, and not all were as smooth as the ones in the photo above. Pierre Vitupier explained: “I figured I came from a strong amateur racing team, and thought I could win against the porteurs while pedaling with only one leg… I came 6th or 7th. [The following year] I trained for the Championnat des Porteurs like I would for a road racing championship, 8000 km training on the road… I won the race.” The race was a big deal, with the main roads of Paris closed off for the event. The newspapers reported in great detail, as they would of a Tour de France stage. Many of the best-paid porteurs had custom bikes built: one for the daily job with wide 650B tires and large fenders, and one for the annual race, much lighter and basically a racing bike with fenders and a big front rack. A replica of one of the racing bikes, built up from a genuine frame and rack (above), is featured in our book The Competition Bicycle. In addition to the interview with the two porteurs, Joel Metz summarized the history of the Championnat des Porteurs in the same issue of Bicycle Quarterly. Moving on to cycling as transportation, we tested different ways to carry a heavy load, and compared different geometries to determine which is best-suited to different load carrying configurations. We do not say that you should ride your bike no-hands with 28 pounds of bricks in the front bags, but a good bike should make it possible to do so. That means that the bike will be stable in traffic, which increases your safety and enjoyment. We also found out why the old porteurs carried their heavy newspaper loads on a front, and not a rear, rack. It simply makes the bike more maneuverable, especially when riding out of the saddle in heavy traffic. We did a comprehensive study of bicycle geometry under the title “How to Design a Well-Handling Bicycle.” We looked at historic examples of well-handling racing bikes, city bikes (above), randonneur bikes, touring bikes, even tandems and track bikes. We measured their geometries. 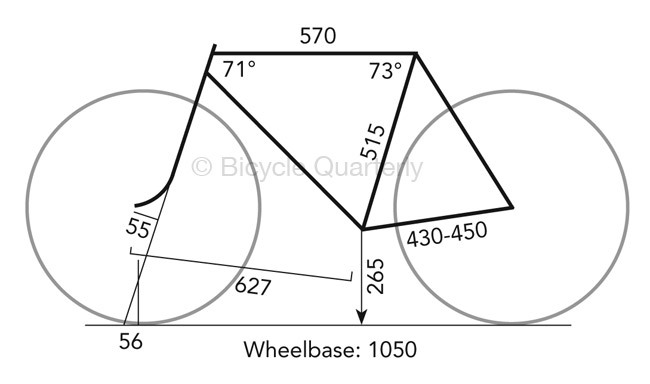 We explained the factors that determine how a bike handles, and why some geometries work better than others. A custom-built Ant “Basket Bike” designed to carry heavy loads. Breezer’s Uptown 8, fully equipped for riding every day. And the Jamis Commuter with a very affordable price tag. To provide some perspective, we featured a classic Alex Singer city bike (above). Then there were more tests of tires, why tucking on downhills is faster than pedaling, as well as the columns My Favorite Bike, Builders Speak and much more. Click here to order your copy of this exciting back issue (BQ 19) or to subscribe to Bicycle Quarterly. Jan, have you compared loads on top of the front rack to panniers, on platform racks or on low rider mounts. Yes, that was part of the experiment. This is a nicely written article about the history of the French Porteurs. The late 40’s and the 50’s must have been an exciting time for cycling in France. The War is over and the economy is recovering. What a time to feel alive. Ah, to cycle to a cafe and enjoy an espresso and pastry at an outside Paris cafe would be wonderful but alas, today, it is only a romantic picture within my brain. Thank you for a look back in French cycling history. It’s actually still a part of life in Paris, and with the Velib, it’s easy to do. However, it’s easy to forget the sporting nature of much of French cycling. Even French utility bikes were lighter and more performing than those of most other European countries. You are welcome to include my Civia Halstad in a test similar to the ANT. Thank you for the generous offer. The Ant test was published five years ago, but we’ll revisit transportation from time to time. We’ll consider the Civia if it’s still available then. Simply stated, running front panniers increases your steering moment of inertia. This is desirable if you are touring, commuting or carrying large loads. Does the Alex Singer pictured above have some kind of chain guide for the front chainring? Or is that not necessary with only 4 or 5 cogs in the back? It’s not necessary with few cogs on the back and relatively long chainstays. This is one of my favorite issues. The commuter/ city/ utility/ porteur bikes seem to be growing in popularity and for good reason! I know that price is a factor, but is it possible to make an affordable integrated bike elegant and beautiful?? The test bikes (Singer aside) leave much to be desired in that regard. There are so many options for carrying a load, and/ or commuting. I would be curious to see the fantastic effort and balanced reviews applied to more than just the handmade Rando of my dreams from BQ. (Oregon Manifest issues are great!) It would seem that the BQ recipe for a well performing randonneur bike has been made clear in each review of a new hand-made PBP ready bike, but what ingredients make a transportation bike great are still up in the air. I guess I just mean that I like this issue, and I’d like to see more of it’s kind. Price is always an issue. Makers still think that touring and transportation bikes need to be low-priced, and that riders are willing to pay for top quality only in racing bikes (road or mountain). Once that changes, we may see better and more beautiful bikes offered ready-to-go. I’m partial to standard steel tubing dimensions myself, but I think the Breezer and the Ant are rather handsome and well-proportioned, with the aesthetics reflecting the function. Just as with cars, your basic transportation bike is often designed to be more affordable and not as sleek as performance models based on racing cars, but can develop an iconic style all its own–think Volkswagen Beetle. I always thought the Dodge Dart was a good basic design, great motor. I don’t think it fair to insist on comparing it to a Porsche, though. The Singer has 650B wheels. It’s a small frame, so the wheels look bigger. 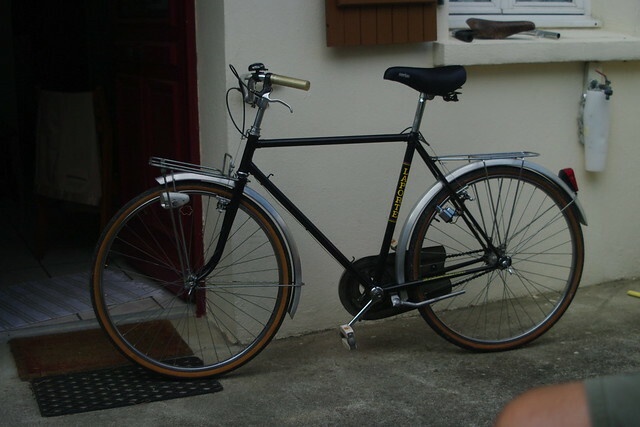 Both the porteur replica racer in the first photo and the Singer in the last photo have similar bars mounted low. I have a bar like that, a Velo Orange “Belleville” model, mounted on an old, circa 1980 Colnago. Very unusually for a north American imported Colnago, it is a versitile frame with moderately long chain stays, clearance for up to 30mm tires, and even fender eyelets. I do all my commuting and shopping on it with a rear rack and medium size panniers. One problem: do the two bikes in those photos have bar interference with the top tube when swung to the side (not in riding but just in handling off the bike)? That limits how low I can mount my bar, when it just clears the top tube. I am not sure that is a major issue. The rack will hit the downtube anyhow, so you best avoid having the handlebars swing that far. When you ride, you’ll never turn the bars that far! If the riders often had a marginally lighter bike for race day, why would that bike have fenders?